Let’s face it—we’re all obsessed with athleisure. So get ready to go shopping, because Nike is rolling out a line of athleisure for when you’re sick that looks like your high school tennis team sweatpants and a T-shirt from an old career fair. Uh, just take our money right now!!!!! The new clothing line is specially designed for when you’re stuck at home from work with a bad cold, have nothing else to wear, and just want to put on an unwashed sweatsuit that hasn’t seen daylight since you finished your college applications. According to the company, after you slip into a pair of these sweatpants featuring a pair of faded silkscreened tennis rackets, you’ll feel ready to roll off the couch onto the floor and sit there for a while. Nike has even sized all the pants to fit a little loose due to wear, complete with a stretched-out drawstring that’s lost inside the waistband. It sounds like they’re going to be perfect to sit around in for 12 hours at a time while you drink orange juice and watch Shark Tank. Can we have six pairs???? For $75 you can complete the set with a musty T-shirt from a career fair where you put your name down on a computer-programming-class mailing list that you still haven’t unsubscribed from. Nike hasn’t left any details out—the shirt comes pretreated with sweat marks under the arms and unidentified food stains all over the “Seniors 2009” graphic that’s printed on the back. 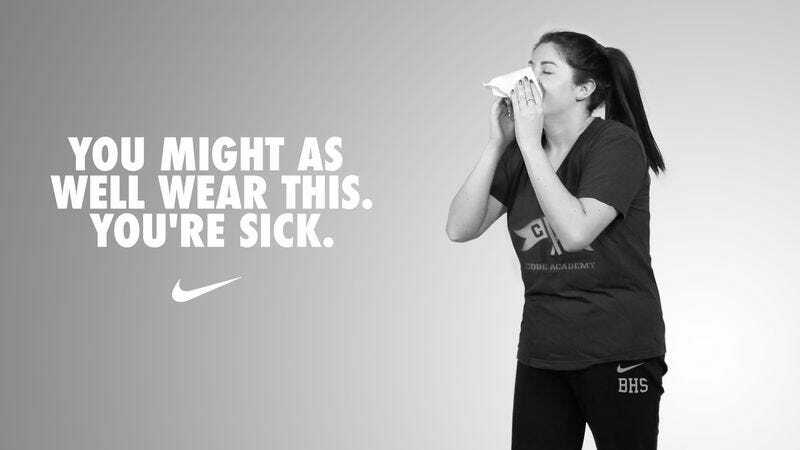 Yeah…we’re already looking forward to getting sick, rocking this outfit all day long, and not having the energy to take it off later to shower. Great move, Nike!! !